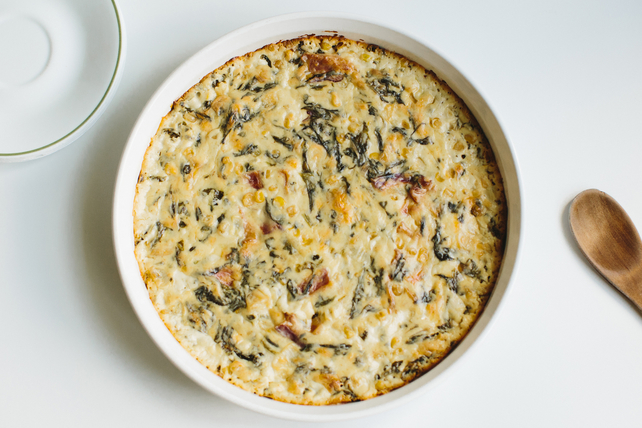 Smoky bacon and sweet corn add layers of deliciousness to this already tasty creamy spinach dip. Serve hot and bubbling and prepare for compliments! Cook and stir bacon in large skillet until crisp. Remove bacon from skillet with slotted spoon; drain on paper towels. Discard all but 1 Tbsp. drippings from skillet. Add onions to reserved drippings; cook and stir 4 to 5 min. or until softened. Add corn and spinach; cook 2 to 3 min. or just until spinach is wilted. Add cream cheese and milk; cook and stir 3 min. or until cream cheese is completely melted. Remove from heat. Stir in Parmesan, shredded cheese and bacon. Bakes 20 to 25 min. or until heated through. Substitute stemmed fresh kale leaves for the spinach.